Servoflo is pleased to announce the availability of a driver reference design for the mp6 micropump. 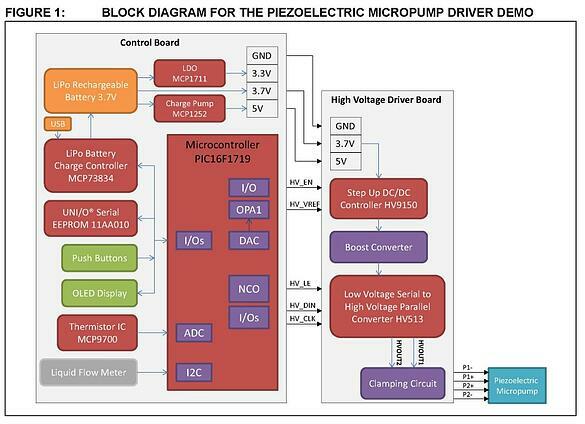 Written by Microchip, the application note describes the implementation of a basic circuit for driving the mp6 with flow control for a fluid delivery system. The application note includes a description for a control board, a high voltage driver board, and the mp6 micropump. The control board provides the adjustable voltage and frequency control signals to the high voltage driver board. Then, the high voltage driver board delivers the boosted signals in specific waveform on multiple output channels with adjustable peak-to-peak voltage (VPP) and frequency to the piezoelectric micropump. The demo can supply a maximum of 250V of VPP and a maximum frequency of 300 Hz. A bill of materials is included with the application note.